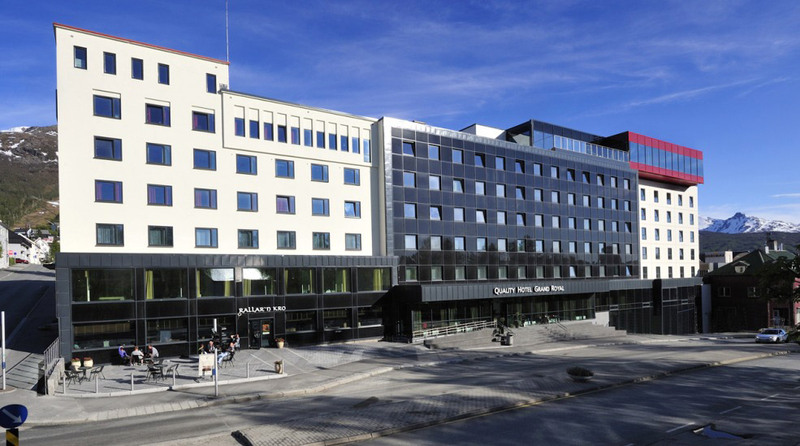 Quality Hotel Grand Royal is one of northern Norway's biggest conference hotels, right by Narvik Station and just three minutes from Narvikfjället ski resort. There is a great deal to see and do in Narvik. There are 5,000 year old rock carvings here, the Ballangen Museum (mining) and the War Museum (Krigsminnesmuseum). Go on an Orca whale safari, try sea fishing, wreck diving, mountain biking or a round of golf in the midnight sun. Narvikfjället ski resort is within walking distance of the hotel, with the best off-piste skiing in Scandinavia. Quality Hotel Grand Royal's modern conference section has capacity for up to 700 people in the Royal Hall banquet hall. We also offer 11 smaller meeting rooms. Rallar'n Pub og Kro offers lighter meals for when you're in a hurry. If you'd prefer something more exclusive, why not visit our Linken Restaurant & Bar on the top floor of the hotel. Take the train to Narvik Station. Take the bus to Narvik bus terminal. The airport bus stops just outside the hotel.